We offer 60" round white folding tables ($10) with plastic white folding chairs($1). These tables seat 8 -10 people. Linens for this tables and chairs can be provided also for an additional cost. We also offer 8ft and 6ft long tables ($8) with plastic white folding chairs($1). These tables seat 8-10 people. Chairs costs $0.80 with the rent of any inflatable bouncer, slide or tent. Miami Tent Rentals provides the service of Table linen and Chair covers rentals. Select from a variety of styles and colors of Tablecloths, Skirts, Napkins, Overlays and Drapes for Round and Rectangular Tables as well as matching chair covers. We have just about any style and color to fit your special needs. 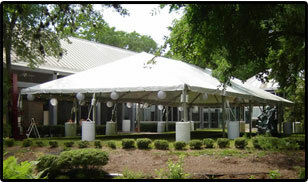 Miami Tent Rentals is the premier source for Party/Events Rentals in Miami Dade and South Broward. 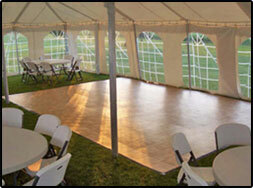 Our main focus is tents, tables & chairs, dance floors and linens. We provide services for weddings, baby showers, parties, fundraising, festivals, corporate functions like car and inventory sales, and sporting events like golf tournaments and triathlons. Whether you need a 10x10 tent for a backyard party or a 40x100 tent for a fund raising event, the Miami Tent Rentals professional staff has experience in all types of events and can assist you in planning for a memorable event. We will help you determine the right size(s) and type(s) of tent(s) as well as the accessories necessary to achieve the appropriate feel and ambiance for your event. Our staff is eager to help you plan your event and then driven to execute that plan for you. Your satisfaction is our main concern. Please call or email us to inquire about our new inventory and innovative party ideas. We stand ready to serve you. We will normally install your tent one to two days prior to your event.